I love this bed frame. It was easy to assemble, and very good quality. The Bonnie Platform bed in an eye catching Antique Bronze finish will dress up any style bedroom. The sturdy metal frame construction and all joints are welded to offer maximum support. A one-piece wood slat support system with center support are included. (No Box Spring or bed frame is required) Easy Assemble in 10 to 15 minutes and no tools required. Just add your mattress and get a great night's sleep. (Mattress NOT included) The Bonnie Platform bed is offered in (3) three sizes to fit your needs. Twin, Full and Queen. 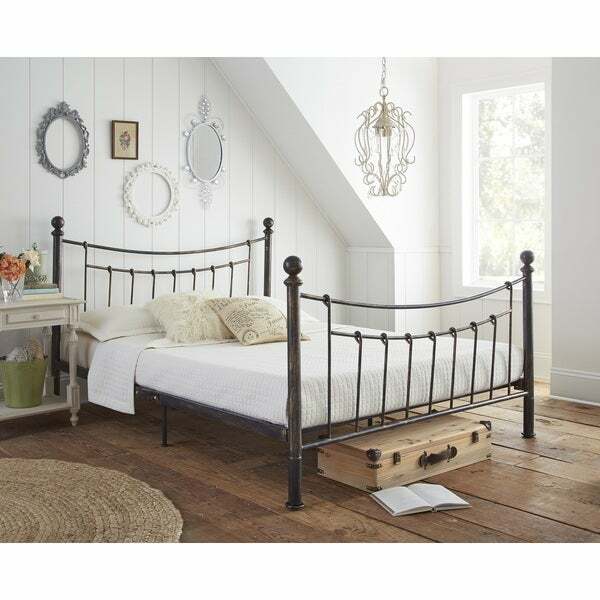 This is a lovely bed frame that works perfectly in my country themed bedroom. It was easy for my husband to assemble and looks great! A definite must have! I couldn't be happier with my decision to buy this bed. It is sturdy with a lovely design. Assembly was easy. The price is reasonable. I plan on ordering a second for my guest room. I love the look of this bed and have been very happy with it until the legs broke off when I was moving it. When I contacted the company, they never called me back, never inquired as to how they could help. Now I have the bed on 6"x6" wooden posts and I'm in love again. The quality of this product is very poor. After less than one year one of the balls on the corners just sheared off. They must be made out of more than one piece that is somehow put together. We have not figured out a way to repair it. My other complaint is that I thought it would have a solid platform to support the mattress, but it is just rough hewn slats. Although I think this bed is very pretty it isn't what I had expected. The material is very cheap. It feels and looks more like plastic. One of my bed post decorations doesn't screw in straight which makes it look even cheaper. I don't expect to get much life out of this product. Easy to assemble, shipping was quick. Overall quality is great for the money. Sturdy with a great look and rustic style. Somewhat difficult to put together but once it was assembled it's sturdy enough. Looks nice and reasonably comfortable to sleep on. "This says it comes in 3 sizes but I only see the option to buy queen. Does this mean you're sold out in other sizes? I'm looking for a full size." "Does this require a box frame?" This frame does not require a box spring or foundation. "What is the weight limit for this bed?" "how much room is there to store things underneath (distance from floor to bottom of platform)"
"How much does the queen bed/frame weigh?" The queen frame weighs 77 pounds.